Tis the season for giving—but also for stressing. Save yourself time and trouble by getting Gleeful gifts for everyone on your list! And fresh breath is the gift that keeps on giving. There’s nothing like Glee Gum before a long flight or after a garlicky bite! Throw in stocking stuffers like Sweet Stacks and Mini Glee Gum, and fun extras like jigsaw puzzles and gum dispensers. You could be the Hanukkah hero or the new St. Nick! But, don’t just stop at our site and store locator. We’ve got more ideas for you! The fine folks at TwirlyGirl offer swell suggestions in their post “From Boutique Girls Dresses to Chewing Gum: 41 Great Gift Ideas for Kids.” Highlights: teepee play tents and Triceratops socks. We want both! And, the Joyful Organizer posted a sweet li’l stocking stuffer guide that includes our favorite reusable bottles, RADIUS toothbrushes, and a Glee Gum discount! Then there are the bloggers of From Dates to Diapers, who call their holiday gift guide “A Few of Our Favorite Things.” It’s got way more than a few. Expect a LOT of inspiration! Good luck and happy holiday shopping, chums. You’ve got this in the bag! Meet Maddox and Danica, sweet siblings with soft spots for Glee Gum. And they aren’t shy about explaining why! “It is delicious and makes me happy because it is a safe and healthy gum that I can eat,” says ten-year-old Maddox. “It is yummy and it makes me feel like a jumping kangaroo!” adds Danica, who is seven. What happens when these two kids are not chewing gum? We had to know. “When I’m not chewing gum, I’m licking a gum pop so I can get to the gum!” announces Maddox. And “I’m sad,” Danica admits. Jokingly, we think. But, rest assured, these kids have other interests. Maddox, for example, loves money. And Danica loves being a cheerleader. Aren’t kids the best? Maddox and Danica’s mom kindly reports that, in fact, the whole family loves Glee and Glee Gum Pops, and enjoys sharing them with friends, too. “Thank you, Glee, for making REAL treats!” she says. To which we say, thanks to YOU, too! 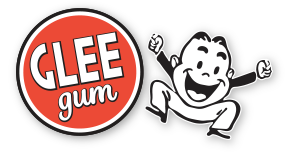 If you would like to be considered as our next “Featured Fan”—and win a case of Glee Gum for the honor— simply send an email introducing yourself to our mascot, gleeguy@gleegum.com. Getting hand-written mail is the best. Thanks to Megan in Pennsylvania for sending this li’l love letter to us. You made our day! We feel pretty strongly about trees here at Glee. By which we mean, we LOVE them. Glee Gum is made with sustainably harvested chicle from sapodilla trees (and you can watch that process here!). Our company is also a proud partner of Trees for the Future, an agroforestry resource center that brings sustainable land management programs to developing countries (we welcome you to participate in our related tree planting program here!). This past weekend, we got a chance to do some tree planting right near our Rhode Island headquarters. Thanks to a splendid award from the Providence Neighborhood Planting Program, we received free trees (plus soil and sidewalk preparation) in exchange for several hours of volunteer time spent planting them. Neighbors joined our Gleeful crew, and we planted a total of 18 beautiful new trees in Upper South Providence. We can’t wait to watch them grow! Here are a few snapshots from the day. Non-GMO Month kicks off today, and Glee Gum is a proud sponsor. Join the fun! Created by the Non-GMO Project in 2010 as a platform for raising awareness, Non-GMO Month provides a great opportunity to stand up for the right to know what’s in our food. Sixty-four countries around the world have mandatory GMO labeling or outright bans, including Australia, Japan, China, Russia, and the EU. Not the US, where as much as 80% of packaged food sold in grocery stores contains GMOs. There’s no better time to check out the Non-GMO Project Verified product list. Plus, you can support labeling measures, enter to win daily giveaways, and learn more at NonGMOMonth.org. Enjoy! They’re here! They’re here! And, just in time for Halloween! Meet our brand new, 100% natural gum pops— hard candy lollipops with ooey, gooey, bubblegum centers. Our limited release, special edition pack of ten pops is a swell alternative to conventional Halloween treats. Each pack contains a mix of three delicious flavors: Sweet Strawberry, Crisp Green Apple, and Juicy Orange. Gluten-free and allergy-friendly, these pops are made without scary ingredients: no artificial colors, flavors, sweeteners, or preservatives. Simply spook-tacular treats! Give the new Halloween Glee Gum Pops a go. Your trick-or-treaters will thank ya! Sometimes, (sweet) dreams do come true! Case in point: our brand new GUM POPS. Delicious, natural lollipops with natural bubblegum centers. They’re happening! They’re really happening! Stay tuned for more details. These gum pops are coming SOON! Our friends at Green America are giving away $5K to three green businesses, and our company is a proud finalist! Your vote could help us win a People & Planet Award– and enable us to send complimentary Make Your Own Candy Kits to 250 schools with the prize money. How sweet would that be? See how we do our best to fit that bill here. And please cast your vote by 8 PM EDT on Tuesday, September 2, 2014. Thanks for your consideration, gum chums! “Gum is getting chewed out, but one portion of the market is staying sweet,” writes Bo McMillan of CNBC. Guess which one he means! Hint: it’s the natural choice to chew. And don’t forget to pop a piece of gum while you read! Peppermint and Sugar-Free Refresh-Mint Glee Gum Pouches can now be found at select Target stores across the country. Stock up at the following locations. You can even grab a coupon to bring with you here! Jen’s athletic talent and positive attitude are Gleeful things indeed. She was born without legs, but didn’t let that stop her from playing volleyball, basketball, and softball as a kid. Gymnastics was her main passion, and she soon excelled at tumbling, even becoming the high school state champion of her division. Adopted as a baby, she later learned that her childhood idol— Olympic gymnast Dominique Moceanu—was, in fact, her biological sister. The story of their happy reunion has been highlighted in several inspiring documentaries, with more in the works. To which we say, thank YOU, Jen, for being so awesome yourself! Wanna learn more about Jen? You can watch an interview with her from HBO Sports here and from #BeSomebody here. You can also follow her on Twitter and “like” her on Facebook! Want to smile more this year? Try your luck at winning a ONE YEAR SUPPLY of Sugar-Free Glee Gum and RADIUS floss sachets from this fun Facebook contest! We were first introduced to RADIUS floss sachets back in April, and we’ve loved them ever since. Their Vegan Cranberry Floss is made from super soft nylon, plus natural xylitol for dental health—the same sweetener we use in our Sugar-Free Glee! Their handy sachets are the perfect size to keep in your purse, pocket, or wallet, too. And you know our Sugar-Free Wild Watermelon, Lemon-Lime, and Refresh-Mint Glee Gum is delicious. If you win this contest, you’ll enjoy two cases a month for an entire year! This just might be the biggest prize we’ve ever offered. And, there are only three days left to enter! That’s right. It all ends Friday, July 18, 2014. So, give it a go. As our friends at RADIUS say, your teeth will thank you!